Judith Daar, the chair of ASRM's ethics committee and a professor of law at Whittier Law School, questions whether it would be appropriate to put limits on sperm donors. But the ASRM's Sean Tipton doesn't foresee the federal government establishing a sperm donor registry. "They don't want to spend the money, they don't want the hassle," says Tipton. "Before you are going to regulate people's reproductive choices, you have to have a really good reason. I don't think you want to jump in on a legal solution where it's not certain what the long-term consequences would be." "Could a similar regulation be enforced in a natural situation? Would we tell people who want very large families to restrict the number of offspring?" said Daar. "I think we would not favor the law limiting the individual's ability to procreate naturally." Right, Sean, but in a "natural situation" there isn't the possibility of creating 200+ children from one unknown person. And as far as having a "really good reason" for limits and accurate record keeping, take a look at the Donor Sibling Registry Medical page, you'll see a lot of "good reasons" why this industry needs some sort of regulation, including comprehensive medical and genetic testing, updating and sharing of medical information, accurate record keeping on the children born from any one donor, and limits of the number of children born from one donor. The long-term consequences of establishing a more responsible industry would only help donors, donor conceived people, and their families. Instead of pointing people to situations that are unrelated to us, the donors, offspring and parents who have used donor sperm and eggs, why not be brave enough to address the actual issue -- that there is no oversight and regulation in a high profit industry that has acted irresponsibility and without ethics. Mr. Tipton has addressed the issue of regulation by saying, "..we know any regulation of that is likely to impede access and increase the cost." This is not about regulating "people's reproductive choices", or a matter of money, as no one is challenging a person's right to reproduce. This is a different conversation, about the rights of the children this industry is helping to create. They should be able to know that there are limits on amount of half siblings they can have, as well as have access to medical information and to their own first degree genetic relatives. Mr. Tipton tells us that the industry doesn't want the "hassle" of creating a registry for accurate record keeping. I feel that regulation and oversight of the infertility industry is a necessity, and would only improve this broken system, and help thousands of families who have used donor eggs and sperm to create their families. 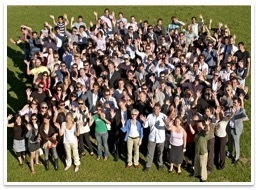 A picture of 200 random people. This picture illustrates the largest number of half siblings reported to the DSR.